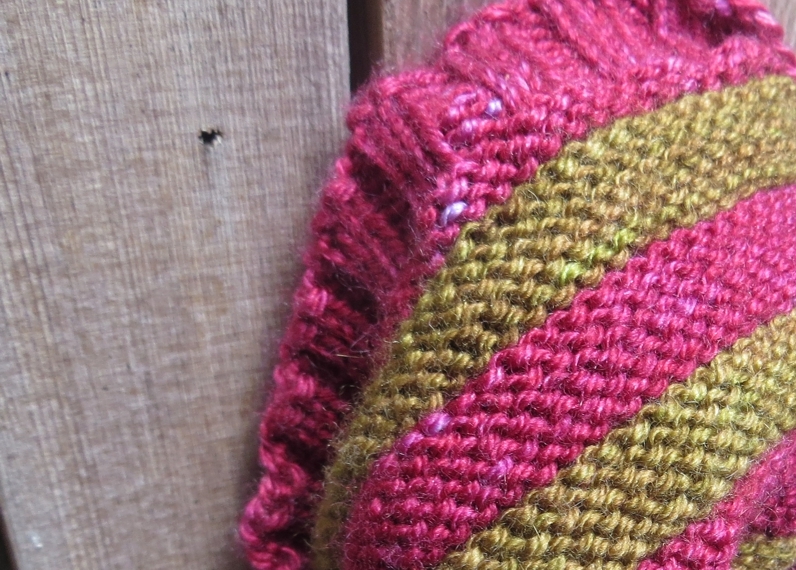 Designing knits is a really, really satisfying activity when it's not frustrating as all get out. 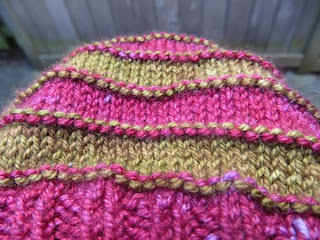 Thankfully, the worst part of the design of this hat (so far) has been finding time to do it, but after five or six months of trying I've finally made some headway. Ha ha. Here it is, looking exactly the way I pictured it when I got the idea. Except for the not being finished part, of course. What do you think of the colours together now? I'm pretty sure I love them, myself. 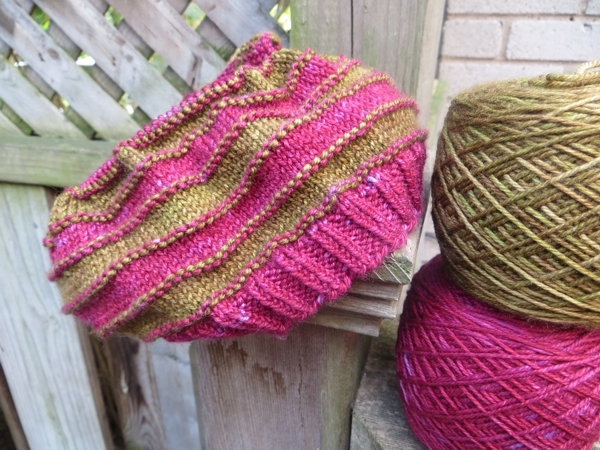 There is something about the fine weight of the yarn, and the amazing fiber content (there's cashmere in there) and the colour contrast, and the lustre as you knit it in soft light, that makes this project very jewel-boxy. It's incredibly pleasant to work on at night alongside an old movie, now that the weather's turned cold outside and the leaves are starting to turn. 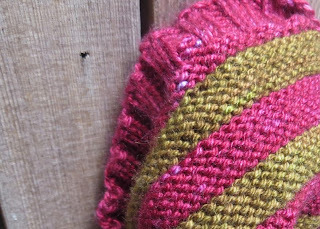 Well, I shouldn't say it's the best part because I'm also really happy with the trick I figured out for keep the stripes perfect and the running in of ends to a minimum. 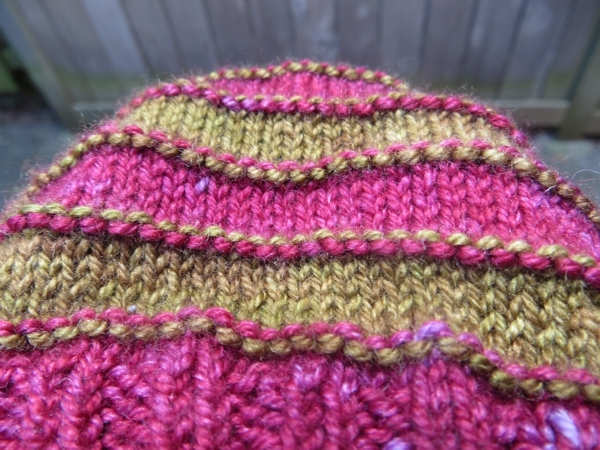 Still: it feels great to stop knitting from time to time to admire these purly stripes. The colours are another interesting thing... I had a hard time decided whether to use the cherry or the moss green for the ribbing, and as I work along I can't help wondering how the hat would look if I'd gone the other way. Luckily, there's enough yarn here to find out. And that's today's Hug: hope you have a great day and that I see you here tomorrow!